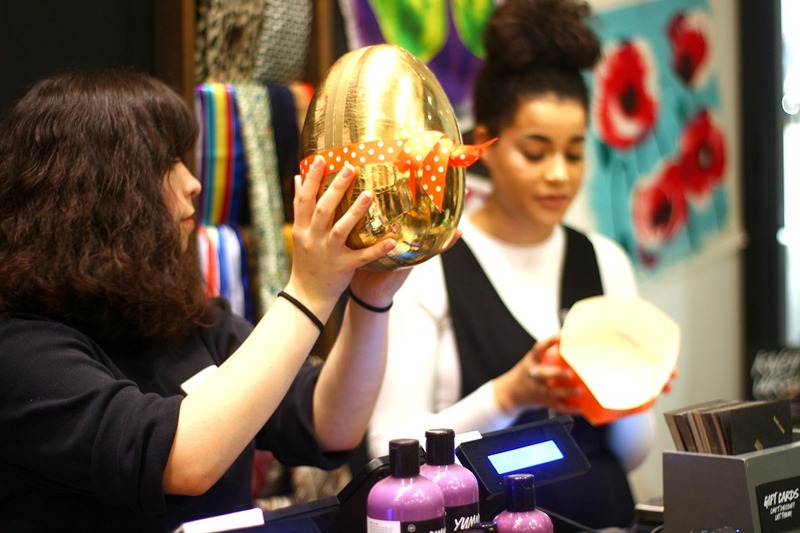 Lush Easter Event & Haul! So starting with their display, they have a whole host of beautifully bright and fun new things. The larger items are actually their gift packs and they started off their event (after the circle of getting to know one another of course), with a quick tour of their mothers day range. 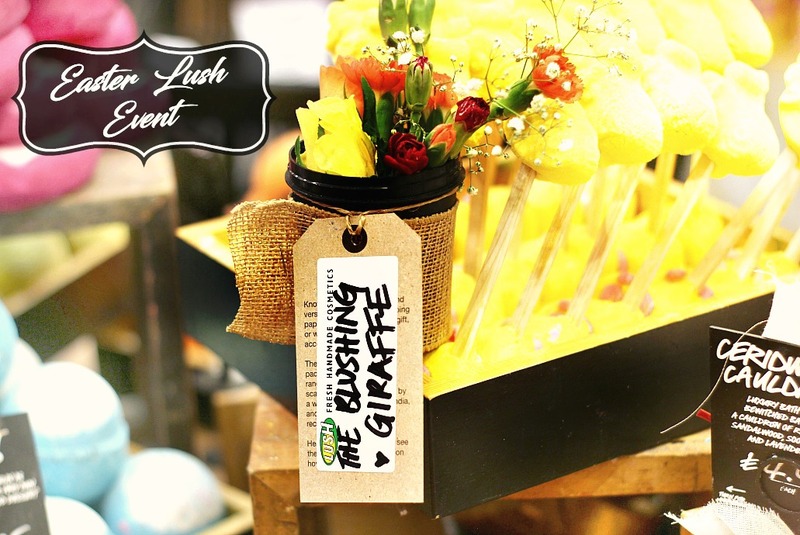 I love how Lush always put together a range of prepacked gifts, thinking about price budgets for all too! 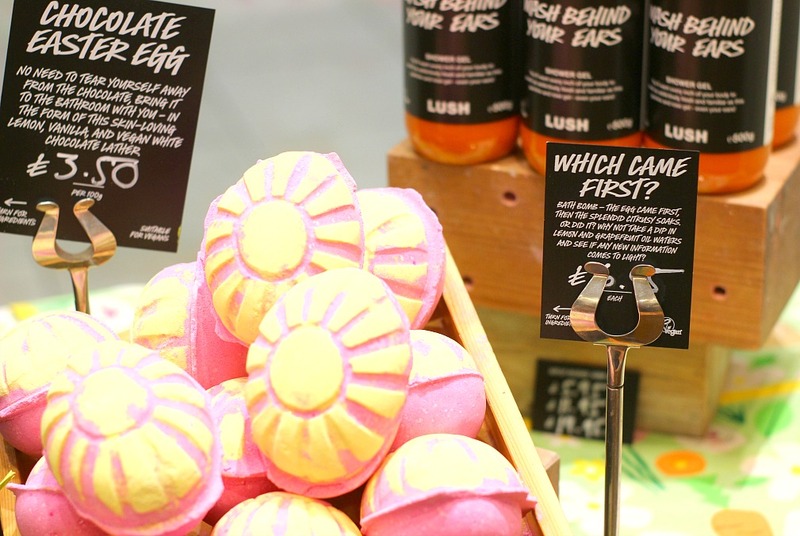 Everyone deserves a lush treat now and again, but especially mums, who work tirelessly around their children. 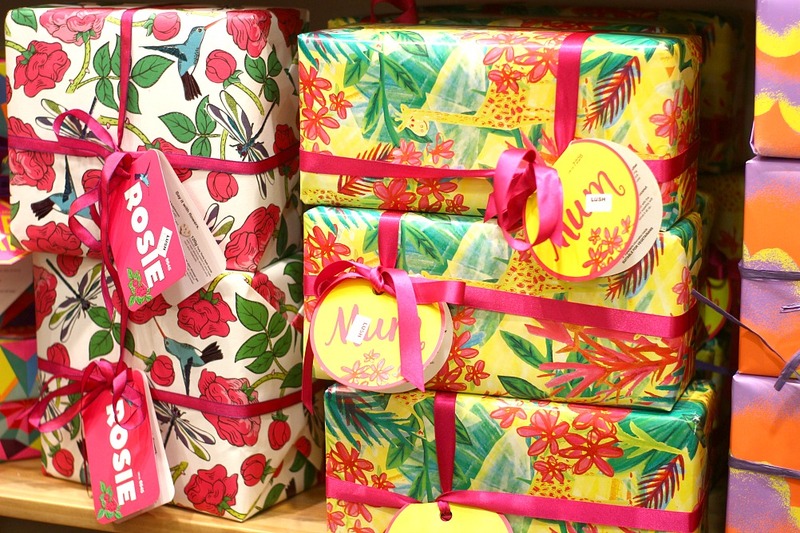 For example the beautifully packaged flowery one called Rosie (£25.50) is an all rose themed gift set as the name suggests! 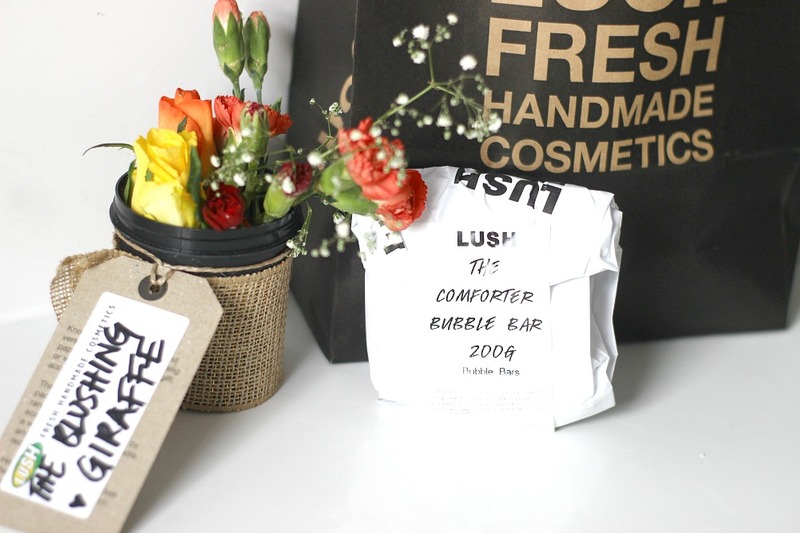 You also get everything you need for a gorgeous pamper, from the tisty tosty bath bomb, rose jam shower gel, body conditioner, argan oil shampoo bath and the rose jam bubbleroon. 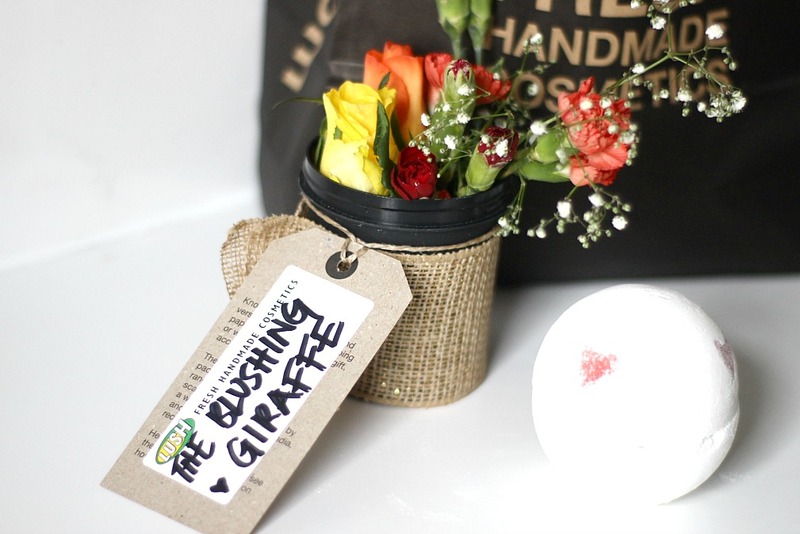 Another one that caught my attention was the MUM gift set, because they have their new adorable giraffe all over it! I think I would buy this primarily for the wrapping paper, who doesn't want little Elsie in print haha. MUM costs £35.00 and as the packaging might give away, it is themed around holidays. So inside there is a coconut smelling scub and cream, the yummy mummy shower cream which has a rich and sweet smell, the coolest double sided bath bomb ever (more on this later! 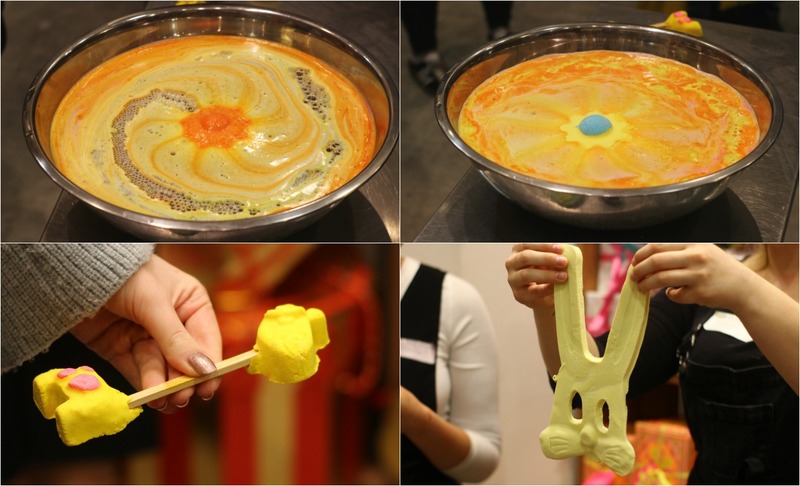 ), a cute body butter in the shape of a bee (scrubee is the sweetest!) and a large bar of blackcurrant scented soap, that leaves the skin smelling great and feeling soft. Talking of Scrubee (£6.95), heres a shot of one of us having a little demo of it. Now Scrubee is a body butter in the shape and design of a bee - super cute! However that is not it's only function, it also works amazingly well at exfoliating and moisturising the skin. It contains ground coconut shells aswell as ground almonds, which works so beautifully at leaving the skin feeling soft and supple. Scrubee contains shea butter, cocoa butter, honey, coconut oil and bergamot oil. It also smells divine! We were all big fans and I'm sad it's not going to be around after easter. I have to say one of my favourite gifts is the Golden Egg, because it has the coolest packaging of all time! 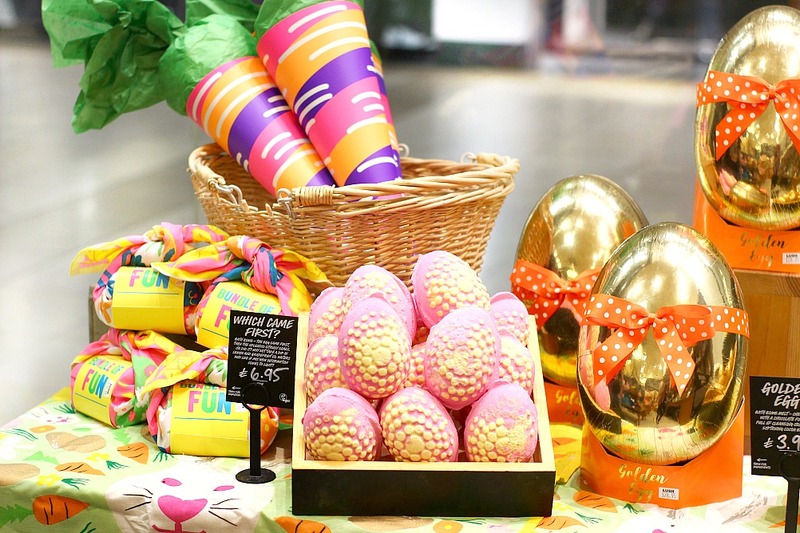 This is around £30 and you get 3 easter bath products, two new and one classic (the glittery golden one which I LOVE). You also get a chocolate scented soap too, so if you've had too much of the sugary stuff, getting scented soap is a much more sensible idea am I right? Something they've brought back this year, with a slight difference is the bunch o carrots (£6.50), last year they were all orange and this year they're a mixture! Each colour has a different scent and the best thing is they're reusable, so you get a decent bang for your buck. And here is a little bit of the purple carrot in action! Which came first? Is pretty pricy, at just under £7 but it has the most gorgeous smell! To me it mainly smells of vanilla, but has a fresh scent too and I'm not surprised, since it contains grapefruit oil and Sicilian lemon oil. If I picked this up, I'd definitely split into at least three pieces to get my moneys worth haha. 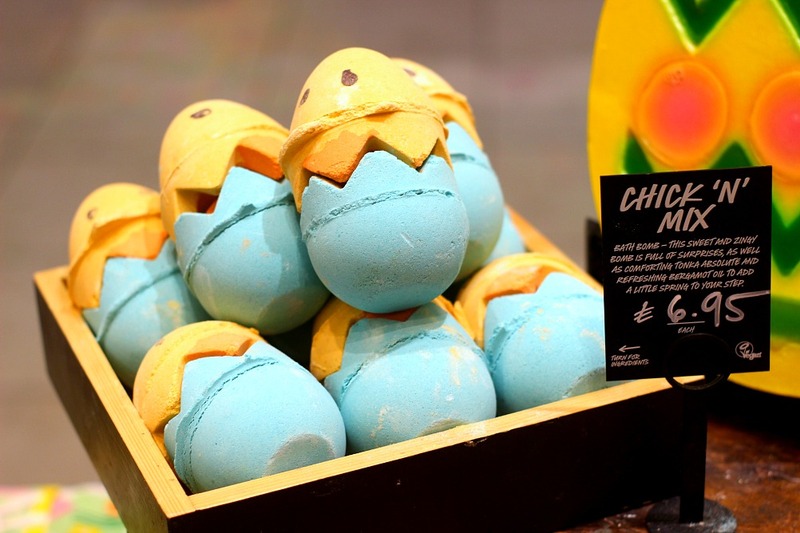 And of course one of their newest bath bombs, which has such a cute design is the chick'n'mix! It has a THREE pieces, so again its pretty good value for money. 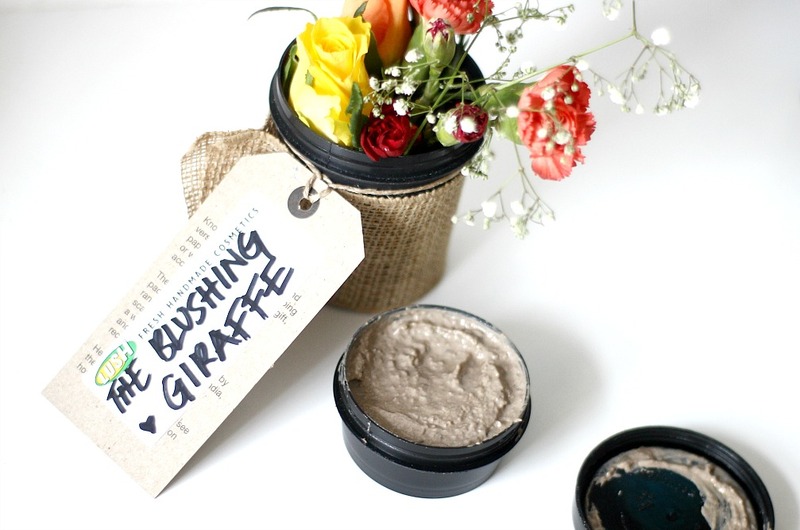 It contains bergamot oil and tonka absolute which makes it smell beautifully sweet. The chick's shell is in two pieces and in the middle there is an adorable little yellow chick inside! Which you can see below haha. 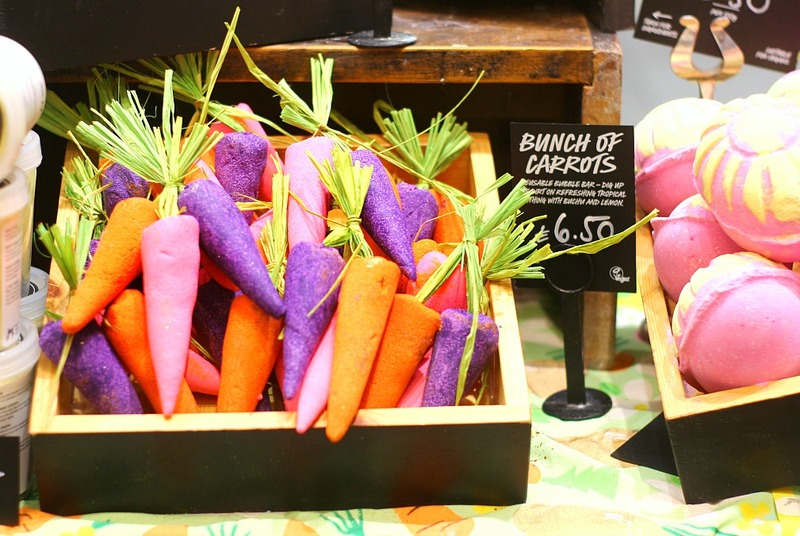 Each piece of this has a different colour and I just think the idea is so innovative and diffferent, go lush team! Above is a MUM bath bomb, which has a really cute little message once the bath bomb has dissolved. And on the left - JUST LOOK HOW CUTE THAT LIL CHICK BE! I decided to pop a few photos together because honestly it's taken me a whole weekend to edit all these photos!!! Anyways the top photos are actually the SAME bath bomb! It's the ups-a-daisy bath bomb, which costs £3.50 and basically whatever way you turn it, dictates the colour the bath water turns. 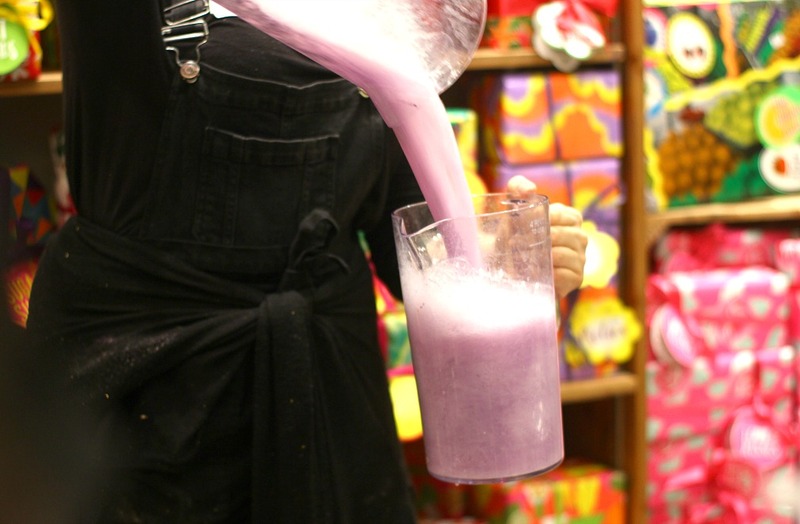 I thought that was pretty unique, the Lush team for this year really went all out! Smell wise its floral and sweet and more of a slow and relaxing fizer. 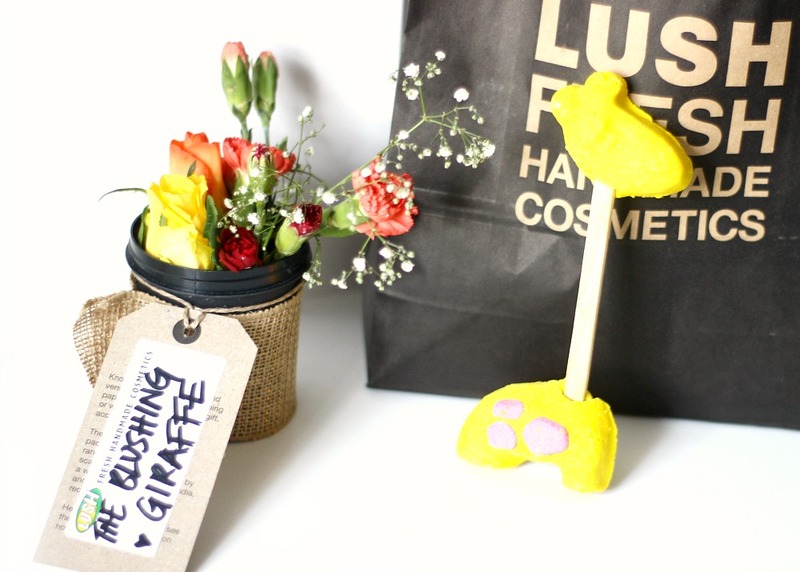 Then bottom right we have the ADORABLE Elsie the giraffe (£6.95) and how could I THE BLUSHING GIRAFFE not fall in love with this cutie?! It's a lemony scent and reusable, I can't wait to try it out. And finally the slightly creepy thing in the bottom right hand corner is flopsy, which is basically a 'face wash jelly'. I wouldn't purchase it, but I can see why you might for your kids, it certainly makes bath time fun haha. Now on to my own haul! Lets start with the things they gave us for free, thankyou Lush :) As you can see we have three samples of shower gels, the only one I've tried so far is the prince charming shower cream and OH MY GOODNESS I am smitten! Clearly I've been sleeping on the whole Lush shower cream range, or maybe it's just the most under rated thing they do - but you guys I am in LOVE. First of all its bright pink, secondly it leaves my skin super clean and soft and finally the SMELL!!! My skin smells divine for the rest of the day, honestly it's like bathing in expensive perfume, I am definitely going back to Lush and picking up a bottle. I think this is a valentines exclusive, so I doubt it'll be around for long :( If you love strong sweet smells, you need some of prince charming in your life. 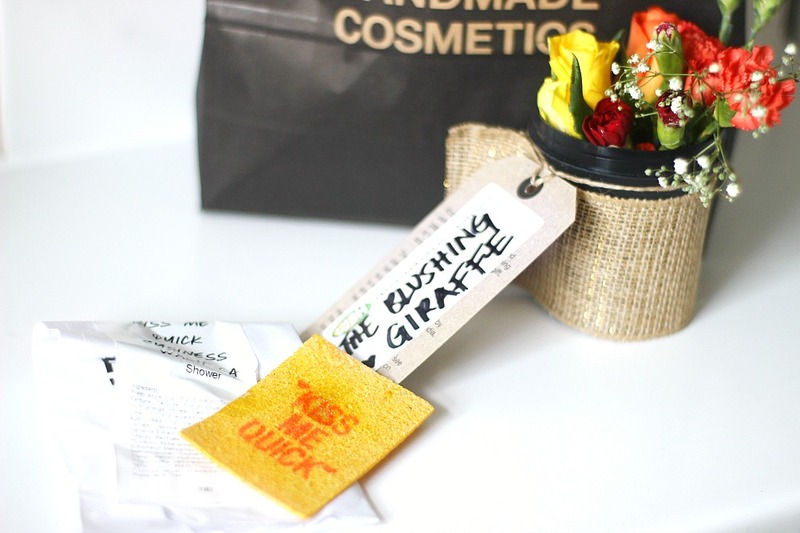 I've not tried this yet, but how cool is the kiss me quick business wash?! They didn't actually tell us about this product on the day, so I had to do a quick google search and essentially SOAP PAPER. The perfect way to travel and stay clean, no spills, no mess and the perfect size to literally keep in your purse. I think its such a genius idea and I'm definitely taking mine on holiday with me soon - saving space and weight whilst travelling, I am all for it! 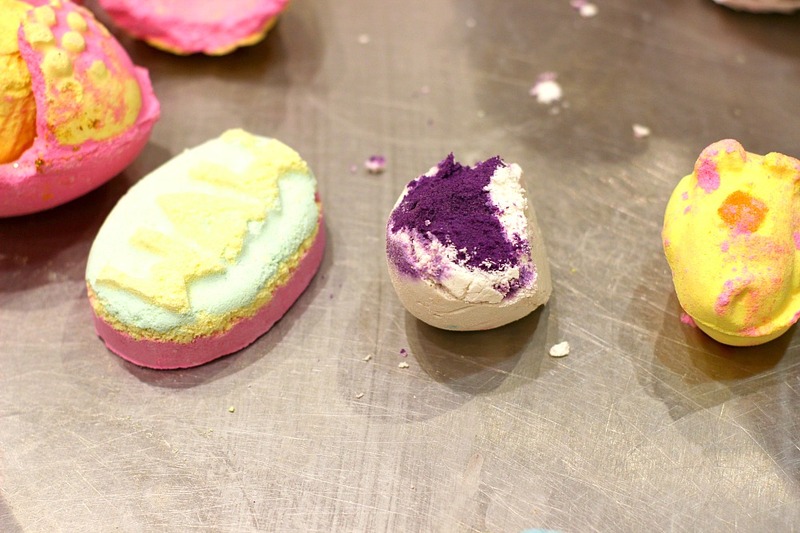 Something else I've never tried, but its a well loved product from the permanent lush range is the comforter bubble bar (£4.45), which you can break up into pieces and make it stretch! According to some, you can get 10 baths out of this, which is amazing and it smells like berries, whats not to love? The Lush team kindly gave us all a free fresh face mask of our choice and I choose Ayesha (£7.25), which contains honey, asparagus and kiwis. These masks have to be kept in the fridge as they're only made from fresh ingredients and I've used Ayesha three times so far - LOVE LOVE LOVE. It is seriously under-rated, because the amount of brightness and glow it gives to my skin - 😍. It looks unappetising in the pot and on the face, but I don't mind in the slightest cause it does what it claims to do! Of course I had to purchase an Elsie the giraffe! And I also picked up one bath bomb, since I still have a bit of a collection left from the x-mas time. This is dragons egg, which everyone only had good things to say about! It has a lemon sherbet and jasmine smell and apparently its a gorgeous one to watch fix up haha. 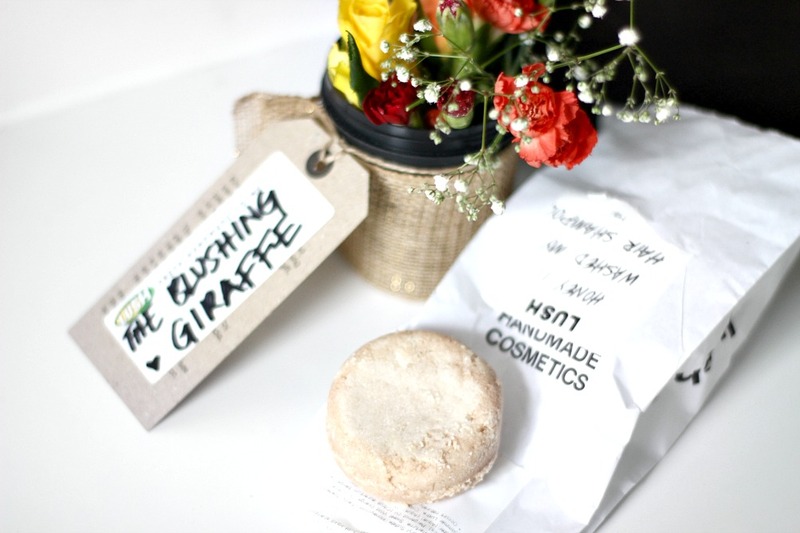 And the final two things I picked up were 1. my first ever shampoo bar and 2. (not pictured) the honey lip scrub. I don't normally buy lip scrubs, but they work a treat and I was feeling like treating myself after a stressful day at school! On to the shampoo bar, which is called honey I washed the kids (£6.25), the reason I picked this up was because I asked one of the lovely staff for some advice. You might know about my skin and scalp problem at the moment, with excessive dryness and I'm 90% sure its due to stress. I am soooo fed up of trying different dandruff shampoos and although I'm getting better at putting oil into my hair, I don't have the time to give myself oil massages on a regular basis. I explained this and the lovely lady recommended me this shampoo bar, which I have seen before but was never drawn to it. I have now used it 3 times and my scalp has never felt better! The dry flakiness has reduced noticeably and my hair feels so soft and clean too. I am so happy I took a chance with this, and a tiny bit goes a long way, because you only need to wet your hands and rub the bar slightly to get enough for the whole scalp so I'm expecting it to last a while! I'm not surprised it's working so well as the main ingredient is honey, which I adore and just a heads up - this'll be in my March favourites without a doubt! PHEW! There we have it! The newbies and my haul, I hope you enjoyed this post. 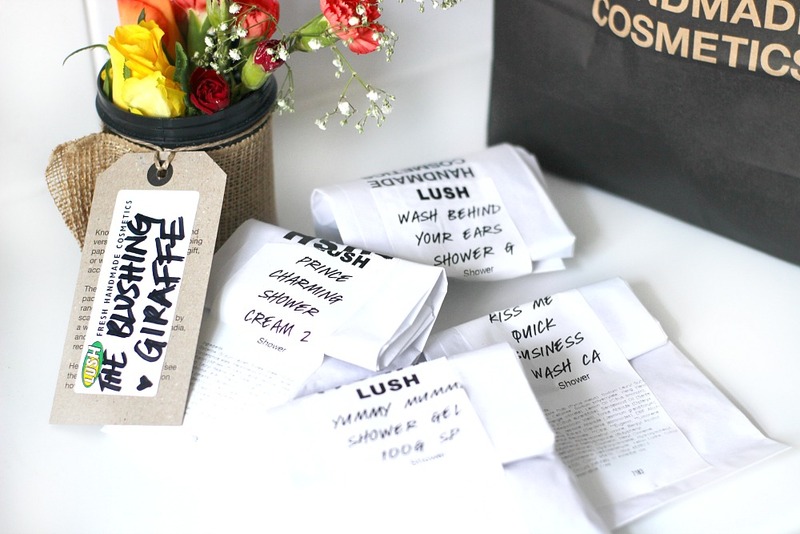 What are some of your Lush favourites? Review | Anaqa Lashes & how to apply! Teacher Training | 6 Months In!